Omg… another online shopping wave is coming. Are you ready for 12.12? Many of us shopped like mad on 11.11 but some missed it or did not shop enough on that day. Fret not because online shopping fever never stops. 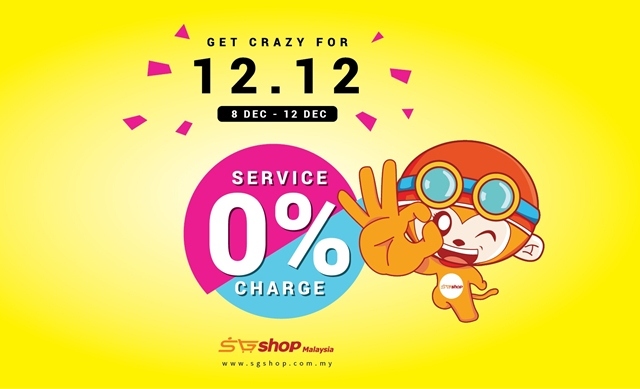 You are going to get crazy when you shop online at SGshop Malaysia, Trusted Taobao Agent because of the crazy discounts, 0% service charge, and on top of that you get 5 chances per day to Spin and Win from 8th to 12th December, 2016. Last month, I did quite a bit of online shopping at SGshop Malaysia not only I managed to grab most of the clothes and accessories that I love at a really good price but also my orders arrived in good conditions and on time. Check out my Online Shopping Made Easier at SGshop experience. Ok back to our 12.12 shopping spree! Remember to head over to SGshop website daily from 8th to 12th December, 2016 and Spin Your Lucky Wheel. 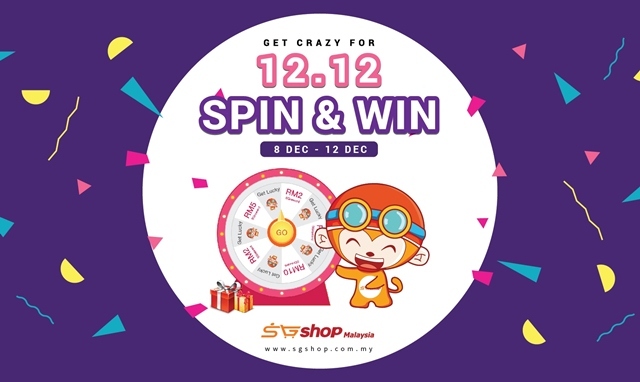 Every SGshop Malaysia member only has 5 chances per day to spin that includes RM10 SGreward, RM5 SGreward, RM2 SGreward, and Let’s Spin Again. Yesss… you get to enjoy 0% service charge. Submit your purchase order (1st payment) between 8th to 12th December, 2016 to enjoy 0% Service Charge for the delivery order (2nd Payment). If you are unsure about what is 1st payment and 2nd payment you can refer to my previous blog post HERE. Kindly take note that, this promotion is applicable to "Buy-For-Me" and “Smart Shop” only. Your purchase order (1st Payment) must be placed and paid within activity period to enjoy the promotion. If the parcel of this promotion is consolidated with non-promotion parcel, the discount will be cancelled. Plus this promotion is applicable to all international shipping methods. Well, online shopping fever never stop! So from 12/11 until 12/12, join and also invite your friends for #SGshopMY Set “D” Free calling. The more the merrier because the more people going we all get to enjoy more discounts and stand a chance to win also Huawei P9 Plus. Wow! How to set “D” Free? 1. Surf the Facebook event page of “Online Shopping Fever Never Stop!” Free during 12th November 2016 to 12th December 2016. 2. Click “Going” and invite your friends to join this event. 3. The participation of you and your friends will activate a discount once an achievement is reached.